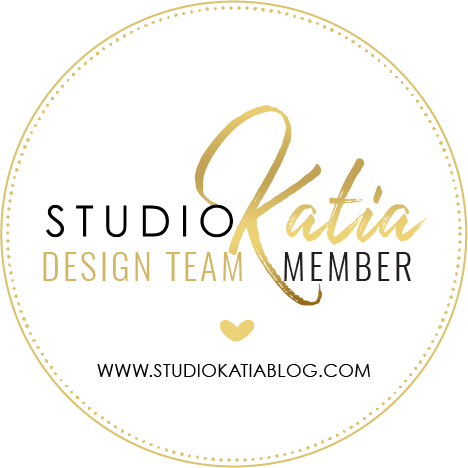 I have a new card to share over at Studio Katia blog. 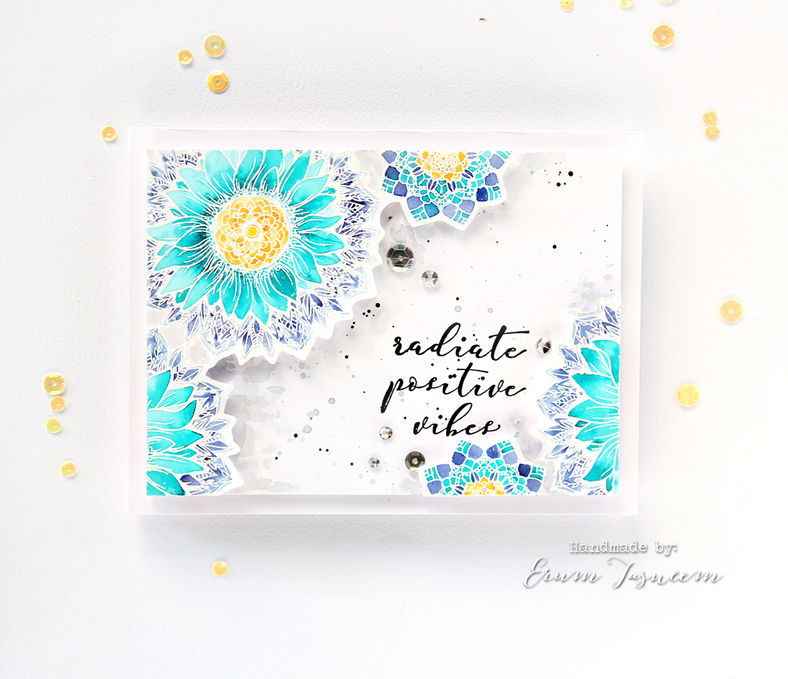 I have a new post on the Altenew blog featuring the newest Artist Markers Set B and the gorgeous Anemones. 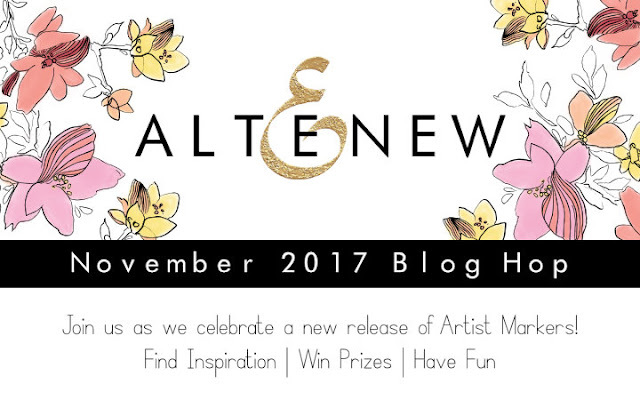 Also, I have a winner to announce for the Altenew Marker Release. 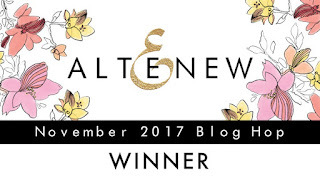 Please contact Altenew at winner@altenew.com to avail your $30 gift certificate by December 15th with the subject "Altenew 11/20/2017 winner from Erum's blog". Here to announce the winner for $25 gift certificate. 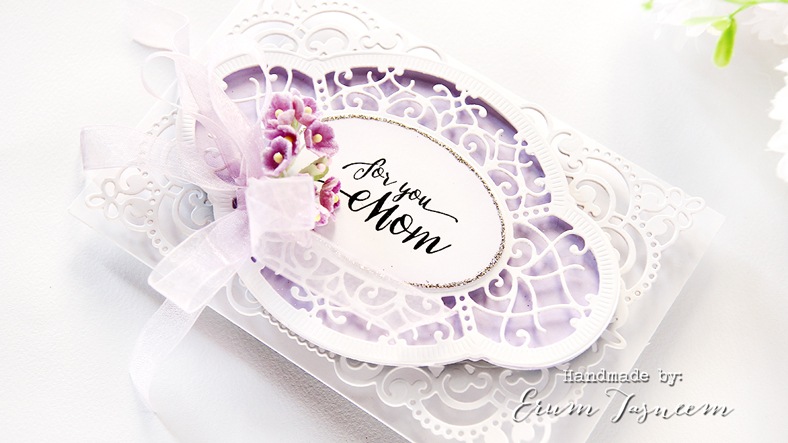 Please contact Spellbinders at socialmedia@spellbinders.us by 11/30/2017 with the subject line Spellbinders November 2017 Blog Hop Winner from Erum's Blog. Hello everyone! 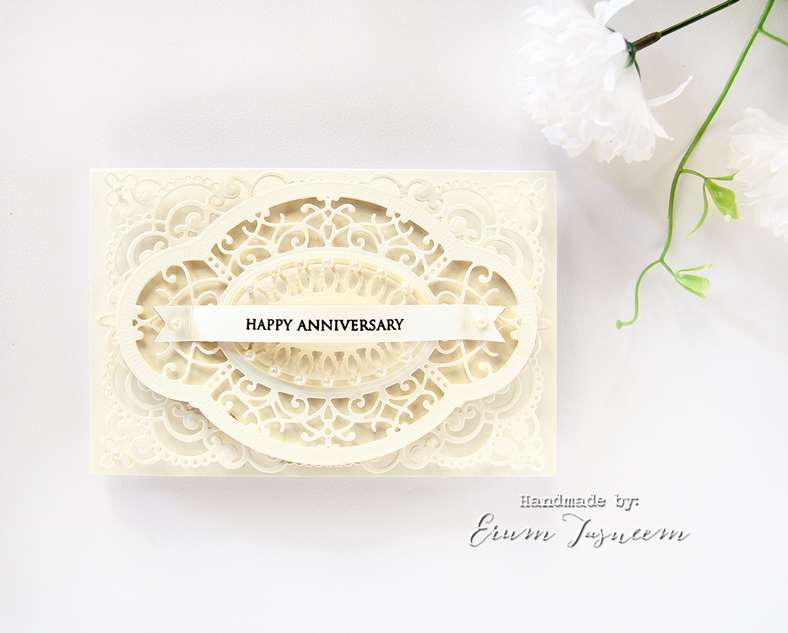 I am honoured to be guesting for one of my favourite companies, Spellbinders. 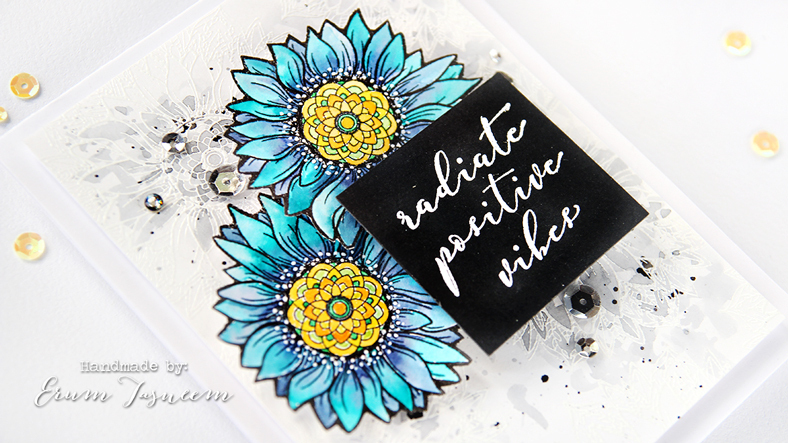 Today I have three cards to share with you using just Sunflower Cool Vibes Stamp Set from the Cool Vibes Collection by Stephanie Low. 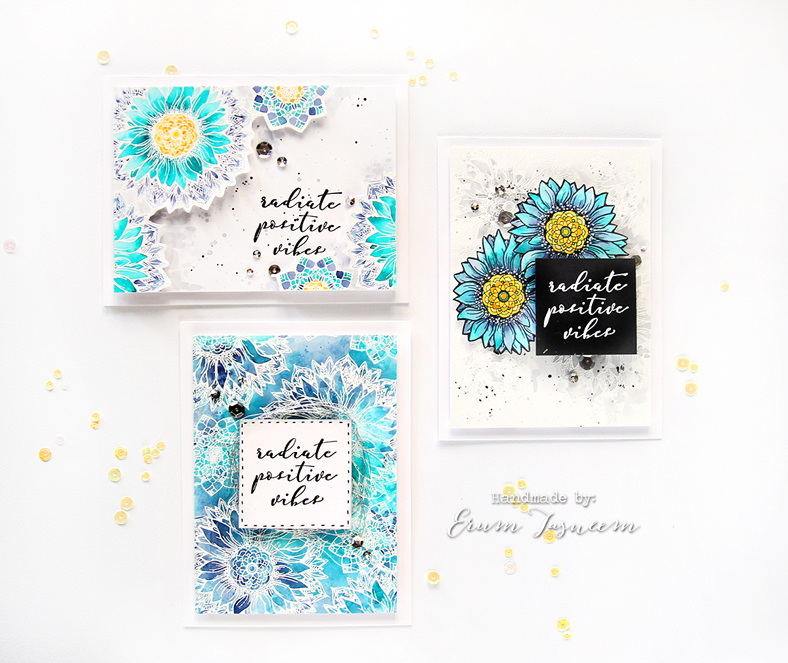 I will be showing you three ways to use this stamp set. First and foremost, I have to say how beautiful this stamp set is! The intricate details all stamped perfectly and crisp. I used both stamps from this set several times with Versamark on watercolour paper. 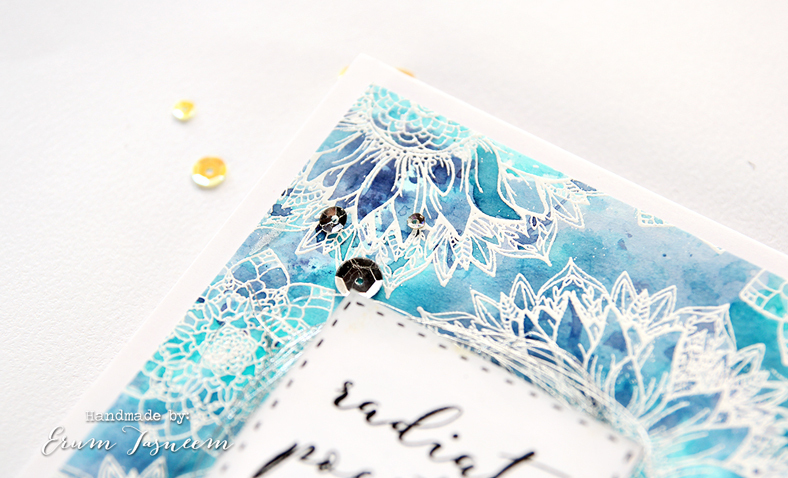 I then used Altenew Pure White Crisp Embossing Powder and heat set it. Then, my most favourite part, I ink smooshed the background using Peacock Feathers and Chipped Sapphire Distress Inks. When the background was still a bit wet, I went in to drop some more of the same colours in a few places to add a bit more interest. To add a little sparkle I rolled up some silver string, glued it on to my card front. I stamped the sentiment and popped it over the string with foam tape. I really wanted to add yellow enamel dots to my card instead of silver sequins but I ran out of them. I think the enamel dots would have looked so much better here and would’ve complimented the other two cards beautifully. 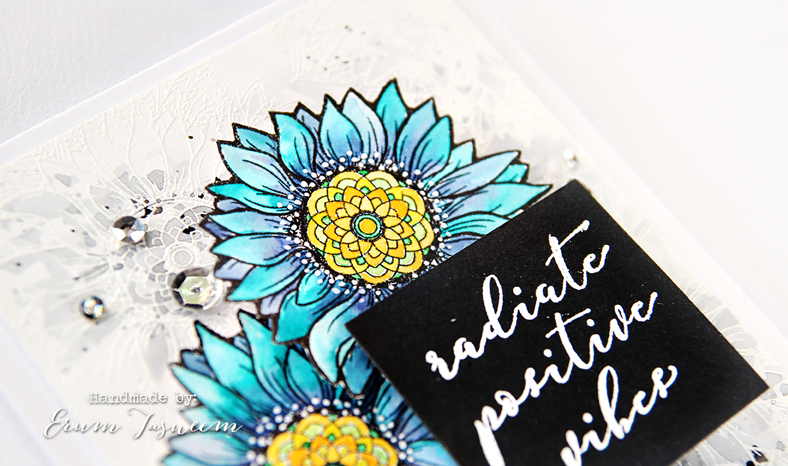 For my second card, I stamped the Sunflower twice on watercolour paper with Versafine Onyx Black Ink. I then watercoloured the petals using Peacock Feathers and Chipped Sapphire Distress Inks. The flower center was coloured with a variety of yellows and greens from the distress ink family. I do love to watercolour with distress inks, they flow effortlessly. After the images were dry, I fussy cut them out and started working on my card front. 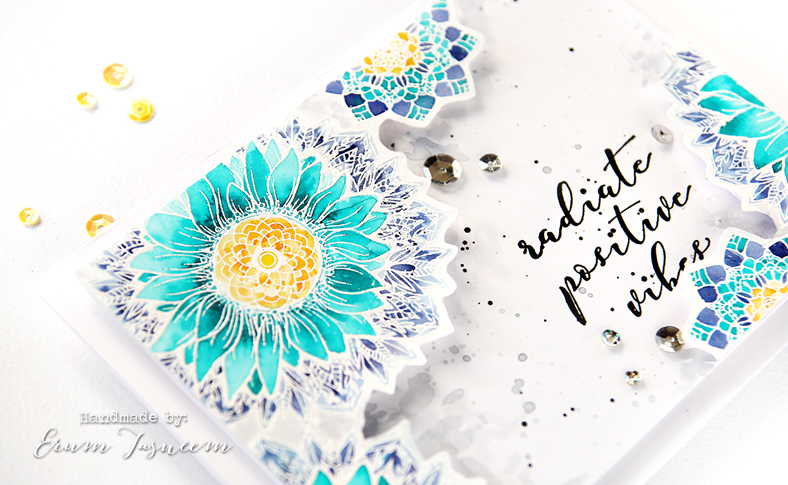 Again, I stamped the Sunflower repeatedly on to watercolour paper with Veramark and heat embossed it with Altenew Pure White Crisp Embossing Powder then heat set it. I already knew what the placement of my flowers and stamp would be, keeping that in mind I added grey watercolour to my background with varied concentration. By varied concentration I mean that the grey would appear dark in some places and light in others. After my card front was dry, I popped my sunflowers on foam tape. I heat embossed the sentiment on black cardstock added a little more foam tape on this label so that it was on a higher level than the flowers. I played around with the placement of all three elements till I found the perfect position. 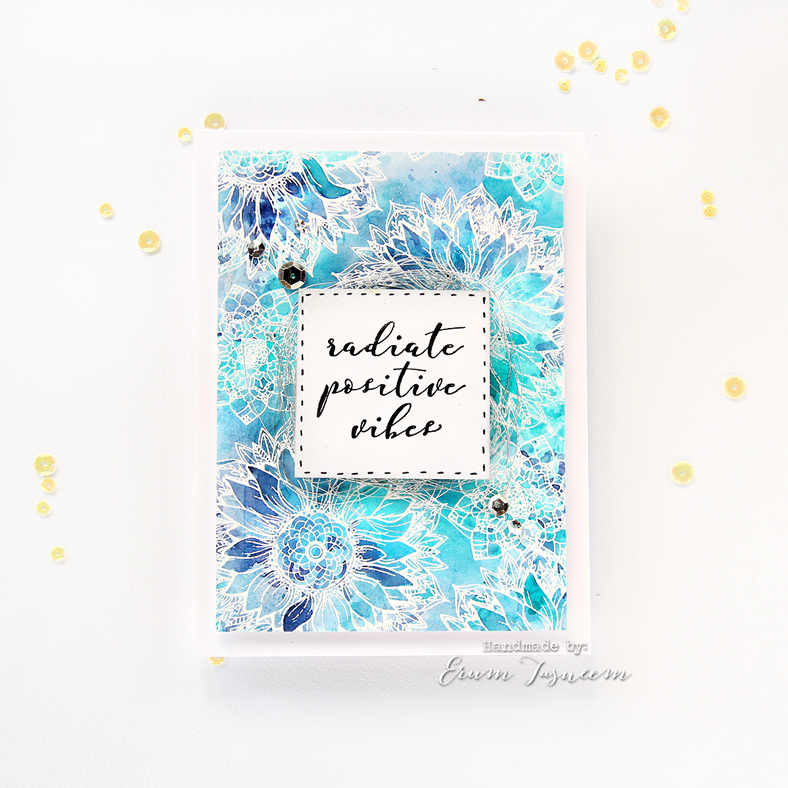 I then covered my stamped images and sentiment label with my hand (you can even use a piece of cardstock or do this step before adding the images) and added black and grey paint splatters. In the end I added a few silver sequins for the bling. Now onto my final card. This one too has white heat embossed images and watercolouring! I stamped both the images from this stamp set on to watercolour paper with versamark in a way that it would make a corner border. Apart from this I stamped both the images again to add to the opposite corner. Then I watercoloured the sunflower petals with Peacock Feathers only, the center with Spiced Marmalade and the outer design with Chipped Sapphire. For the smaller medallion, I used a mix of colours. This image reminds of ceramic tiles. After the images were dry, I fussy cut the design leaving a white border along the design. 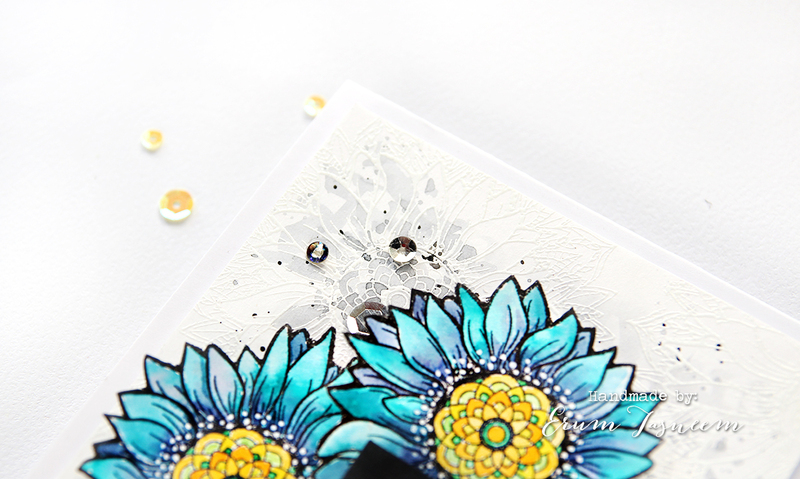 I stamped the sentiment with Versafine Onyx Black Ink and added paint splatters to my card front. I then popped up the two pieces I fussy cut on each corner and added a few sequins. There you have it! 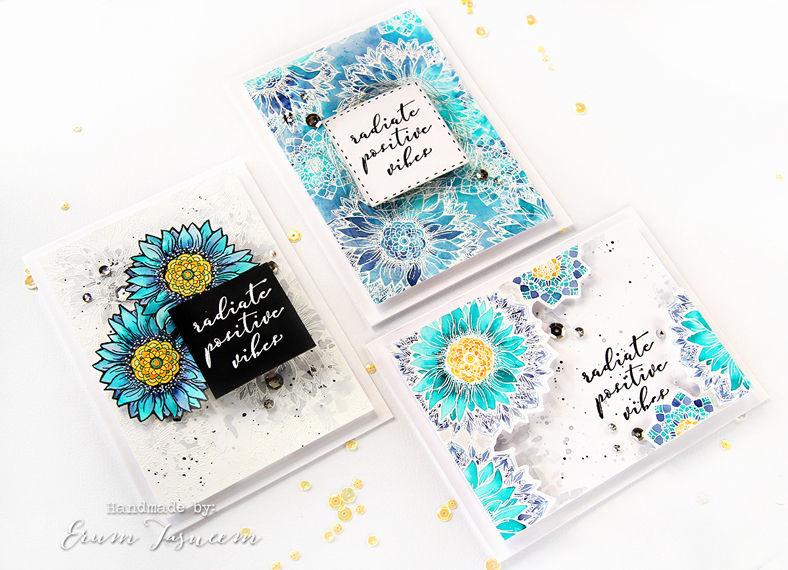 A trio of cards using just one stamp set! I apologize for the delay in announcing the winner! 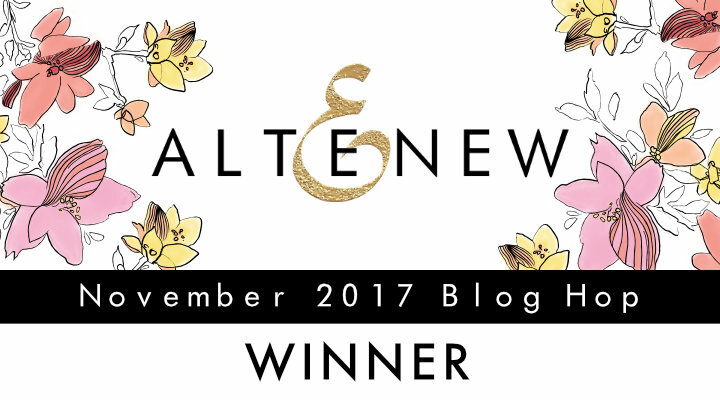 Please email winner@altenew.com with the subject title "Winner BAF Gardenia from Erum's blog" by 12/15/2017. You must be here from Simon Hurley's blog. 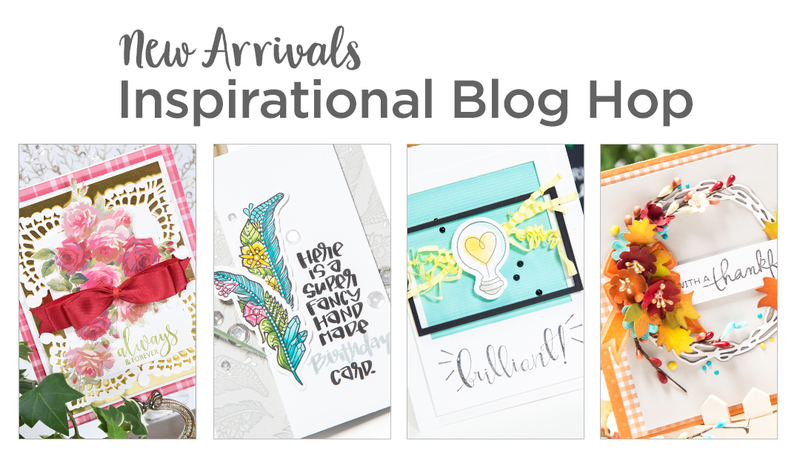 I am SO EXCITED to be part of this hop with Spellbinders. If you have known me for a while, you'd know I run a small business by the name of Glitter & Swirls where I take on commission work (custom orders for cards etc). 90% of the work I do there has a Spellbinders die on it! That is how much I love and use Spellbinders dies. 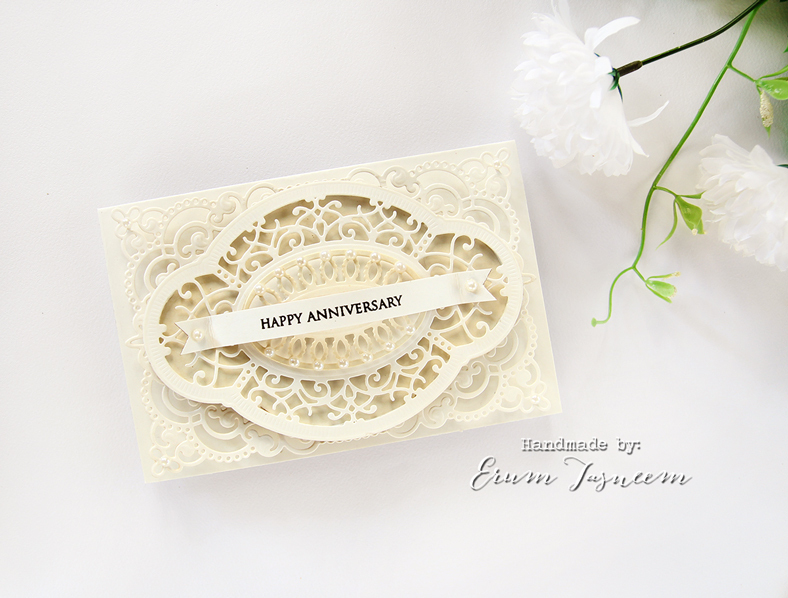 Today I picked out three dies from the Chantilly Paper Lace collection by Becca Feeken who I adore immensely. I have three cards to share with you that uses a mix of three die sets from this collection. For my first card, I used dies from Spellbinders Shapeabilities Annabelle's Trousseau Layering Frame and Hannah Elise Layering Frame. 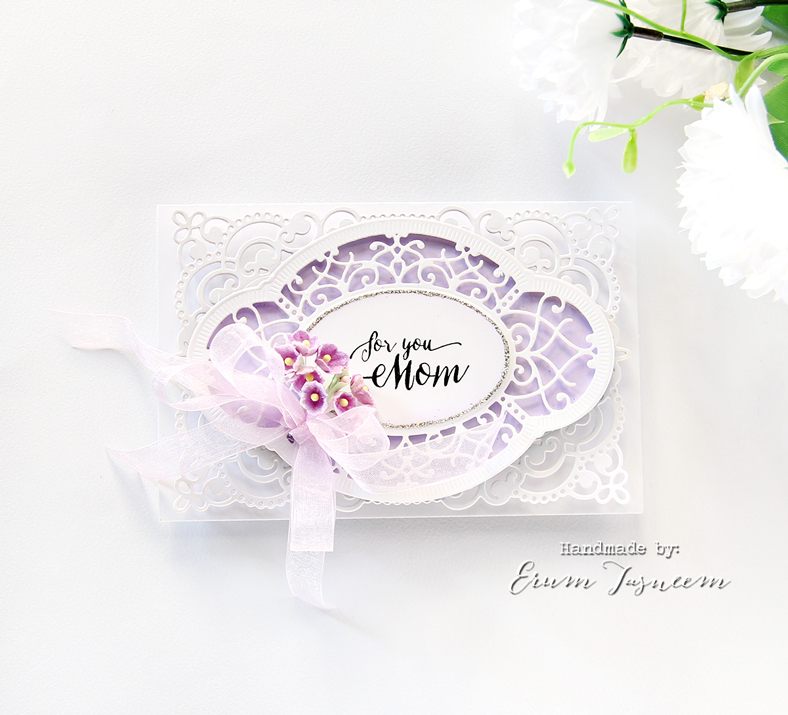 The frames are so gorgeous that you really don't have to do much on your card. After die cutting the frames, I popped them on the card base with foam tapes to add dimension. I don't know if it's visible or not but I added pearls around the smallest oval frame and four on each corner of the largest frame. To make the layer that is behind the Hannah Elise frame a bit darker, I inked it with Antique Linen. 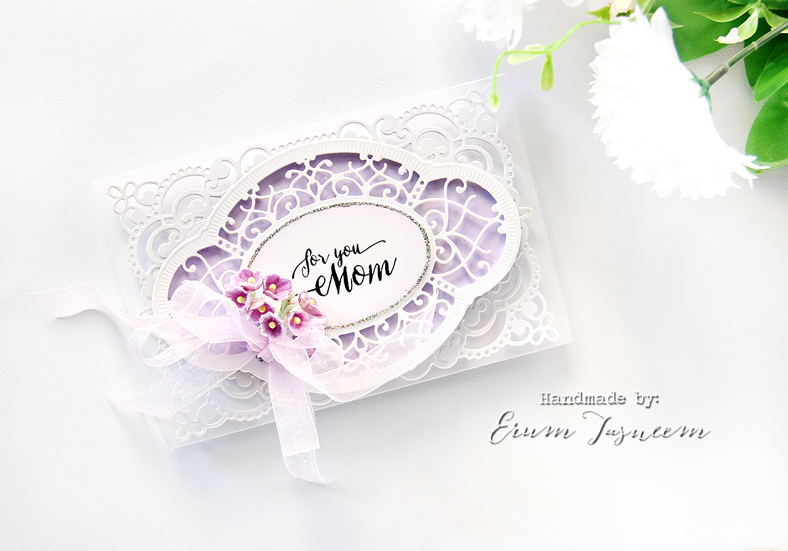 I stamped a sentiment from Hero Arts and added it in a banner style with an arch. I also added two pearls on both ends of this banner. I am always blown away by how intricate these designs are! Next up is a similar card, I just changed the colours and added a bow plus flowers. I made this one in white! Doesn't the card look absolutely different by changing just a couple of things? Here I coloured the layer behind Hannah Elise frame with a mix of Dusty Concord and Wilted Violet distress inks. 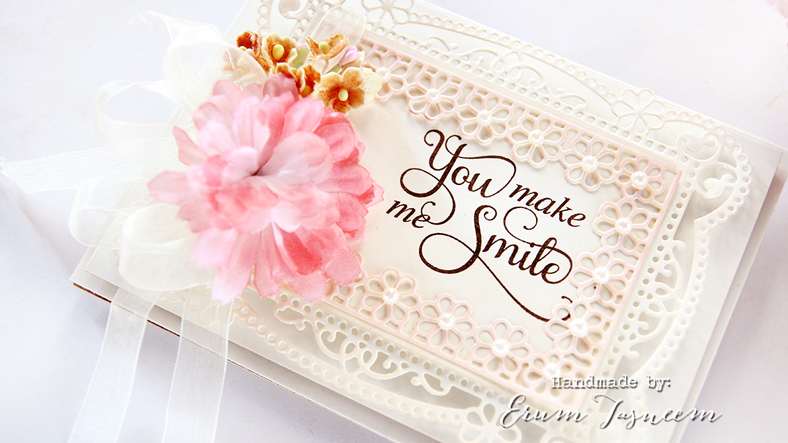 I did not add the small oval die but instead added a large sentiment stamp by Wplus9. I tied a double looped bow and added a small bunch of flowers to add a more feminine touch. 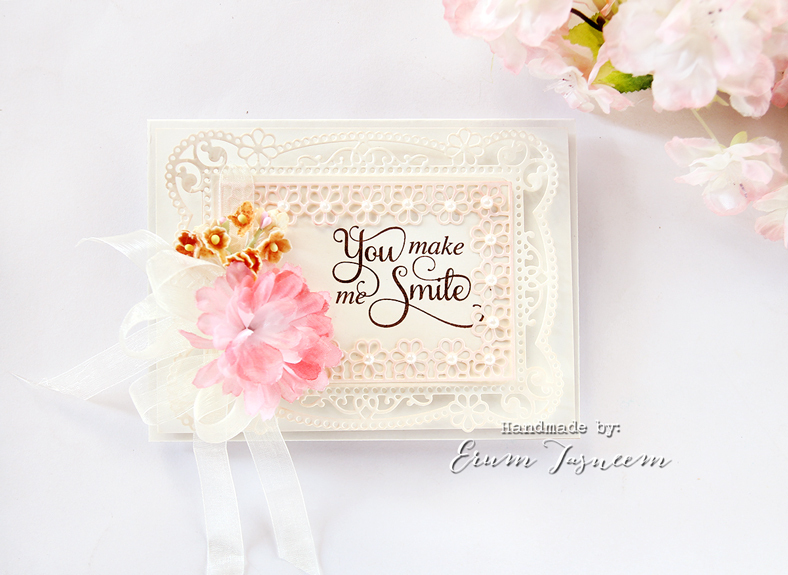 This card features the Tallulah Frill Layering Frame. This is such a beautiful die set! 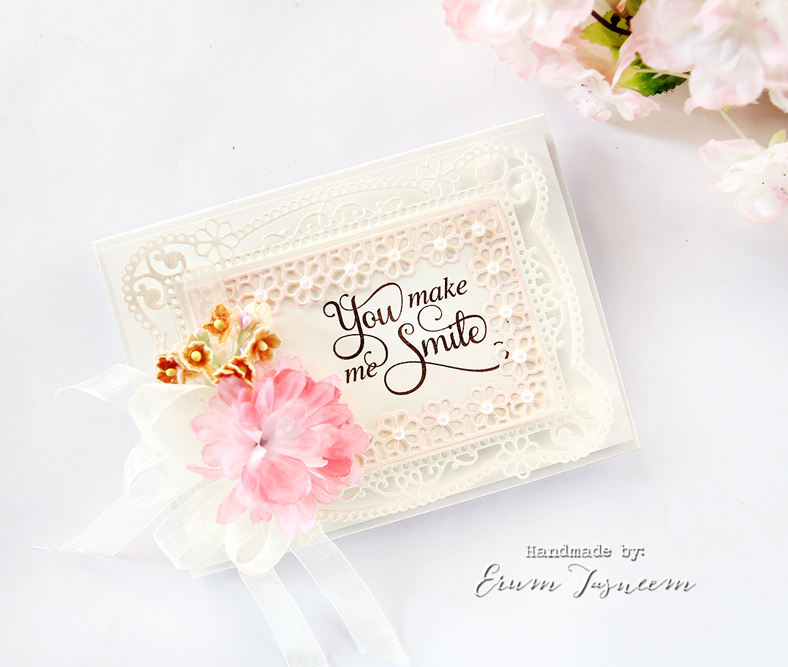 I added pearls on the rectangle floral frame on every flower. It looked so pretty! The sentiment is from JustRite Stampers. I inked the frames with Tattered Rose distress ink. I added a double looped bow on this card as well along with a bunch of small flowers and one bigger flower which I coloured with Worn Lipstick distress ink. I will be giving out $25 gift certificate to one of you! Leave a comment on this post by November 26th and I will announce the winner the following day. Now the next stop on the hop is Laurie Schmidlin. You must be here from Sveta Fotinia's blog. Today Altenew is releasing their Artist Markers Set B and Set C! I know everyone is super excited. 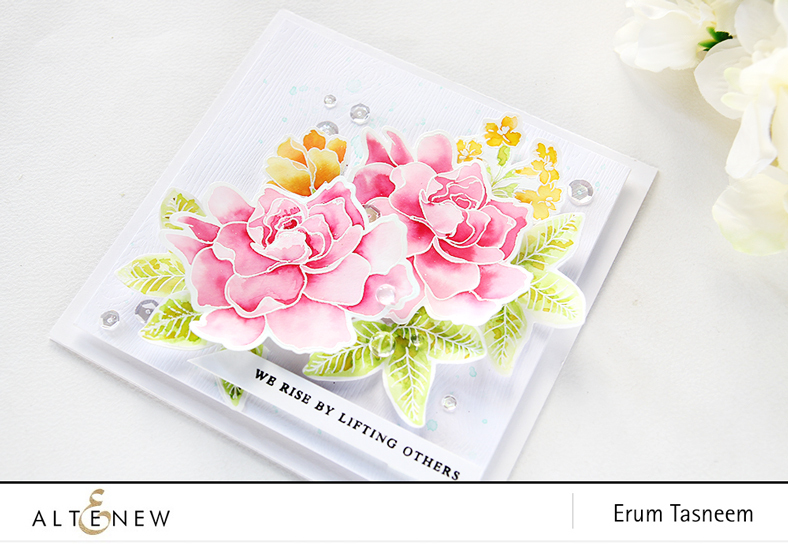 I made a card using Charmed Stamp Set. I used Permanent Black Ink to stamp my image. I then coloured the flowers using Greys and Yellows from Set B and Reds and Blues from Set C.
I then fussy cut the image and popped it on my one layer base. 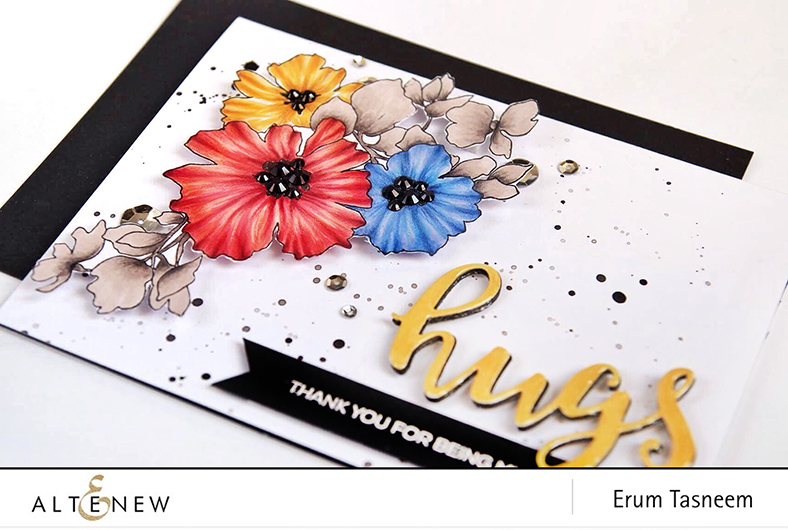 I die cut the word "hugs" from Script Words and coloured the top most layer with Warm Sunshine Marker. 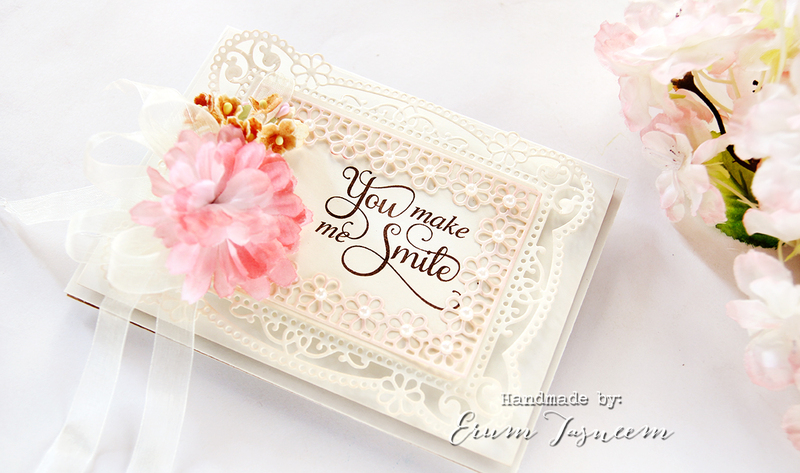 Then I heat embossed a sentiment from Crafty Friends stamp set using Pure White Crisp Embossing Powder. I popped up both these elements with foam tape. Added a few sequins and I was done! I will be drawing out a name from all the comments left on this post by November 27th for $30 gift certificate. Winner will be announced on November 28th. Just dropping in to announce the November release winner. Please email winner@altenew.com by 11/30 with the subject same as my post title and include my name as well. 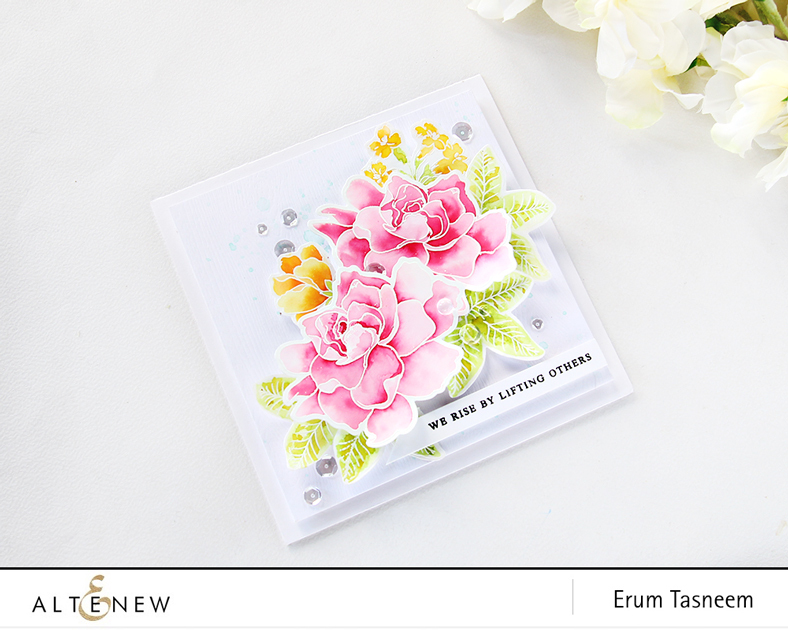 I have a colourful floral card to share today featuring the new Build-A-Flower Gardenia. 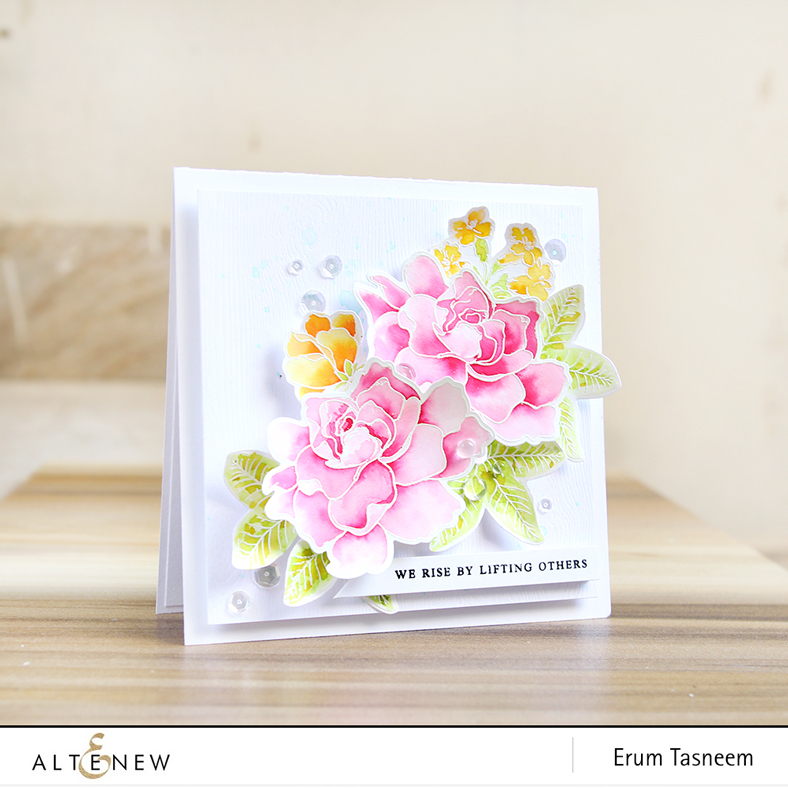 Another beautiful flower by Altenew! 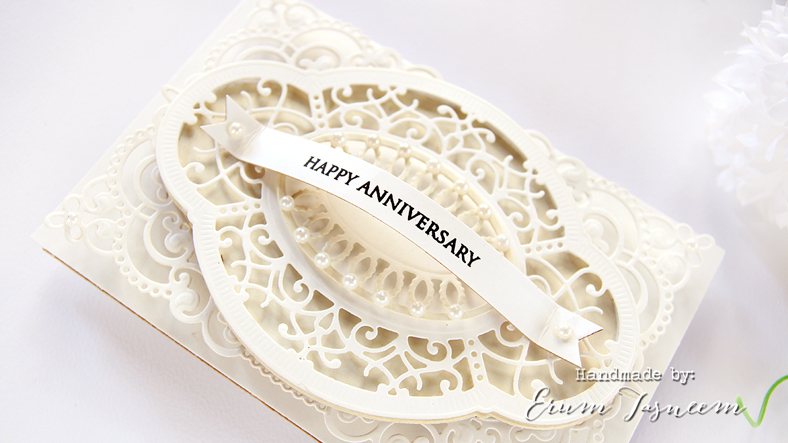 For my card, I used Pure White Crisp Embossing Powder to emboss my stamps. 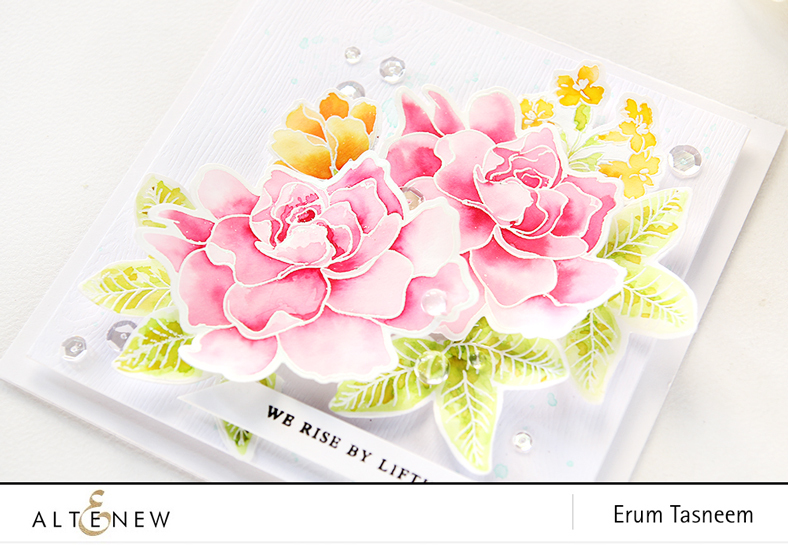 In addition to the gardenia stamp set, I used Peony Bouquet and Coral Charm stamp sets. I used liquid watercolours to colour my images. After they were dry, I die cut them using the coordinating die and placed them in a floral cluster using foam tape. For my card front I used Woodgrain White sheet with splatters of Mountain Mist Crisp Ink as watercolour. In the end I popped up the sentiment and added a few sequins for bling. 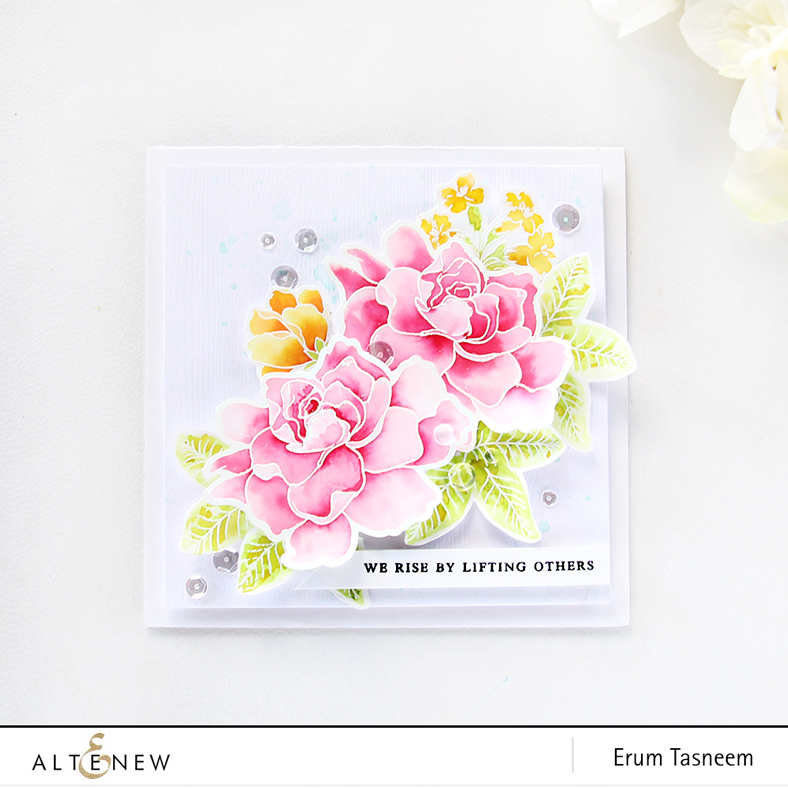 You can visit the Altenew Card Blog and Scrapbook Blog to check all the inspiration using this stamp set. Also they are giving away FOUR $30 gift certificates. Winners will be announced on November 22nd. I am giving away $20 gift certificate. I will announce the winner on my blog on November 20th. That is all for today! Have an amazing day.